Hello my nerdly beautifuls! Hope your week has been great so far! Recently I've been obsessing over beautiful dresses from the Couture Fashion Week, and so when Weddington Way reached out to me to write a post about styling their dresses for the perfect red carpet look, I couldn't wait to get started! I have to say they have the loveliest bridesmaids dresses. 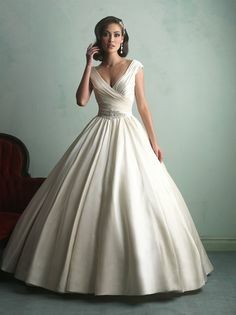 After helping my sister choose her bridesmaids dresses, I've really come to appreciate good bridal collections, and an easy online shopping experience. The great thing about Weddington Way is that you can register yourself and your bridal party as soon as you sign up with them, and afterwards they have a personal stylist contact your party, providing guidance with the process of selecting the perfect dress, for free!!! So, for my first look (above), I decided to go with rose gold and champagne colors. You've probably noticed by now that I love this color palette! Kept it simple with a long elegant champagne colored dupioni dress. I love the bateau neckline, and the mod style it embodies. I opted for rose gold accessories, to keep the look subtle, but added a little edge with red lipstick and red sparkly nail polish by Nars. My second look is a little on the bold side, but I honestly don't think you could go too far off in a red dress. The color carries the look, which makes accessorizing so much easier! The v-neck is just low enough to complement the fullness and inverted pleat of the dress, which both remind me of old Hollywood glamour! 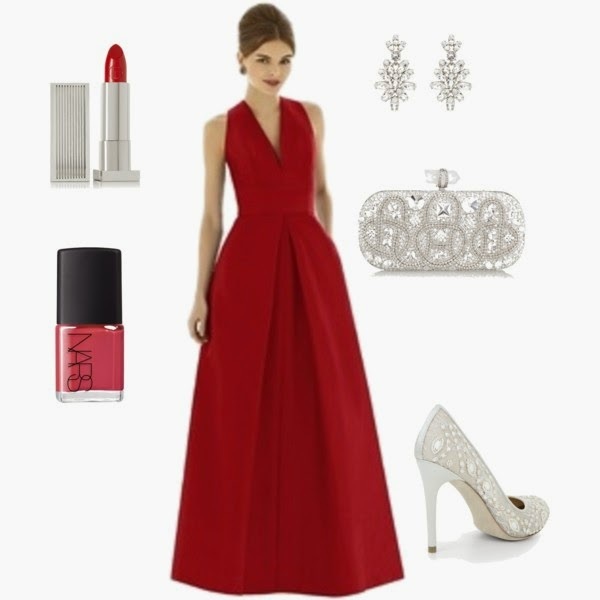 I had so much fun picking out accessories to complement this dress, especially when playing with Polyvore makes me feel like I'm shopping without actually spending money - win! I also love the subtle-glam the silver brings to this outfit. One person in red is awesome but a group in red? Ehn... I vote outfit 1 except if their is just 1 bridesmaid. I don't really get how weddings work. Beautiful, Every thing in this post.. Dress, nail polish, shoes, accessories. I'm loving it! !